Advancements in dental procedures are helping people keep their natural teeth longer. However, because we are living longer and more stressful lives, we sometimes expose our teeth to clenching, grinding, chewing on hard objects, and other habits that make our teeth more susceptible to cracks. You’re probably reading this booklet because your dentist or endodontist has told you that you may have a cracked tooth. Cracked teeth show a variety of symptoms, including erratic pain when chewing, possibly with release of biting pressure, or pain when your tooth is exposed to temperature extremes. In many cases, the pain may come and go, and dentists may have difficulty locating the tooth that is causing the discomfort. All dentists are trained in the diagnosis and treatment of cracked teeth in dental school. Some cracked teeth, however, can be especially difficult to diagnose, and may require endodontic treatment. That’s why you have been referred to an endodontist, who is a valuable partner on your general dentist’s team of trusted caregivers. To understand why a cracked tooth hurts, it helps to know something about the anatomy of the tooth. Inside the tooth, under the white enamel and a hard layer called the dentin, is the inner soft tissue called the pulp. The pulp contains blood vessels, nerves and connective tissue. When the outer hard tissues of the tooth are cracked, chewing can cause movement of the pieces, and the pulp can become irritated. When biting pressure is released, the crack can close quickly, resulting in a momentary, sharp pain. Irritation of the dental pulp can be repeated by chewing. Eventually, the pulp may become damaged to the point that it can no longer heal itself. The tooth will not only hurt when chewing but may also become sensitive to temperature extremes. In time, a cracked tooth may begin to hurt all by itself. Extensive cracks can lead to infection of the pulp tissue, which can spread to the bone and gum tissue surrounding the tooth. What are the types are cracked teeth? There are many different types of cracked teeth. The treatment and outcome for your tooth depends on the type, location, and severity of the crack. Craze Lines: Craze lines are tiny cracks that affect only the outer enamel. These cracks are extremely common in adult teeth. Craze lines are very shallow, cause no pain and usually are of no concern beyond appearance. Fractured Cusp: When a cusp (the pointed part of the chewing surface) becomes weakened, a fracture sometimes results. The weakened cusp may break off by itself or may have to be removed by the dentist. When the cusp is removed, the pain usually will be relieved. A fractured cusp rarely damages the pulp, so root canal treatment seldom is needed. The tooth will usually be restored by your dentist with a full crown. Cracked Tooth: This type of crack extends from the chewing surface of the tooth vertically towards the root.A cracked tooth is not completely separated into two distinct segments. Because of the position of the crack, damage to the pulp is common. 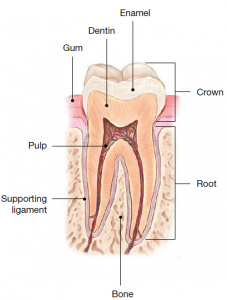 Root canal treatment frequently is needed to treat the injured pulp. Your dentist will then restore your tooth with a full crown to bind and protect the cracked tooth. In some cases, the crack may extend below the gum line, requiring extraction. Early diagnosis and treatment are essential in saving cracked teeth. Even with high magnification and special lighting, it is sometimes difficult to determine the extent of a crack. A cracked tooth that is not treated will progressively worsen, eventually resulting in the loss of the tooth. Split Tooth: A split tooth often is the result of the long-term progression of a cracked tooth. The split tooth is identified by a crack with distinct segments that can be separated. 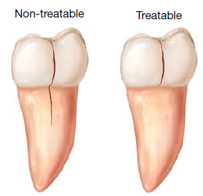 If possible, the cracked part of the tooth is removed and the tooth is then restored with a filling or crown. However, if the crack extends below the bone, the tooth will need to be extracted since these types of cracks cannot be repaired. Vertical Root Fracture: are cracks that begin in the root of the tooth. They often show minimal signs and symptoms and, therefore, may go unnoticed for some time. 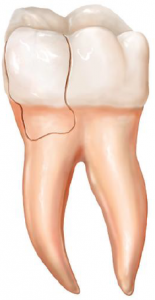 Vertical root fractures often are discovered when the surrounding bone and gum become infected. Treatment usually involves extraction of the tooth; however, endodontic surgery may be appropriate if a portion of the tooth can be saved by removal of the fractured root.